In the past 800,000 years of climate history, the transitions from interglacials and ice ages were always accompanied by a significant reduction in the carbon dioxide content in the atmosphere. It then fell from 280 to 180 ppm (parts per million). Where this large amount of carbon dioxide went to and the processes through which the greenhouse gas reached the atmosphere again has been controversial until now. The scientists have now managed to locate a major carbon dioxide reservoir at a depth of 2000 to 4300 metres in the South Pacific and reconstruct the details of its gas emission history. Their new findings have been published open access in the scientific journal Nature Communications. The reason why the samples were taken in this marine region was as follows: The atmospheric carbon dioxide curve known from ice cores shows that at the end of the last ice age large amounts of “old” carbon dioxide were released into the atmosphere. Its old age means that this carbon dioxide comes from a reservoir that had not been in contact with the atmosphere for a long period of time. From a climate historical perspective the most likely place where the carbon dioxide is hidden is therefore the oceanic deep water. Most of it is in the Pacific, and it contains around 60 times more carbon than the pre-industrial atmosphere. The examined sediment samples come from water depths of 830 to 4300 metres; they go back 35000 years and contained calcareous shells of single-celled foraminifera that live on the seafloor and are important for climate reconstructions. The calcareous shells were radiocarbon dated (14C) and thus provided information about the age of the above-mentioned water mass where the organisms lived, and about the period in which there was no exchange between this water mass and the atmosphere. “The older a water mass, the more carbon dioxide it stores, because bound carbon in the form of animal and plant remains constantly trickles down from the surface,” says Dr Thomas Ronge, lead author of the study and geologist at the Alfred Wegener Institute, Helmholtz Centre for Polar and Marine Research (AWI). This allowed him and his colleagues to find out that the water of the Southern Ocean approx. 20,000 years ago was strongly stratified and the individual water masses hardly intermixed at all. “Our results were surprising and indicated that the deep South Pacific during this glacial period was not only augmented with old carbon dioxide from the decomposition of organic material, but also as a result of eruptions of submarine volcanoes,” Thomas Ronge explains. On the basis of these new climate data, the AWI researchers are now able to draw the following picture of the ice age ocean 20000 years ago. 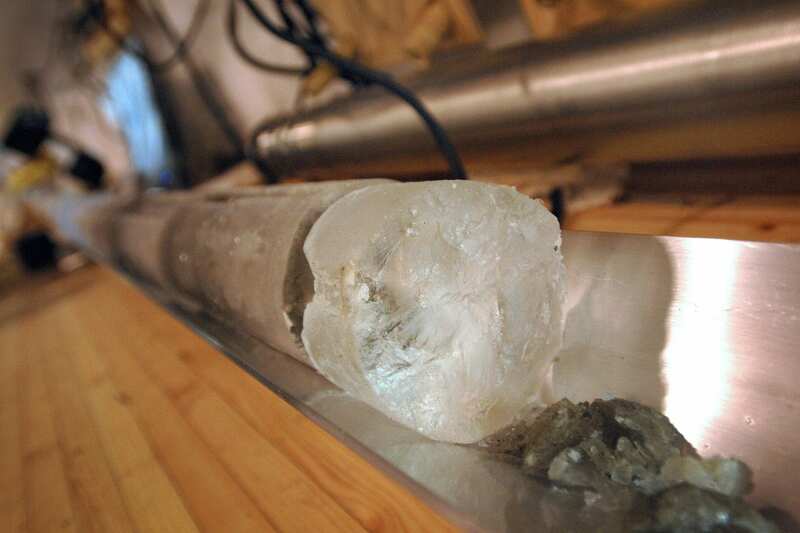 “We know from other studies that it is likely that during the transition from interglacial to ice age a large sea ice cover formed on the Antarctic Ocean, which closed the oceanic ventilation window. At the same time, the Southern Westerly Winds moved northwards, so that the buoyancy in the Southern Ocean was reduced and only a small amount of deep water reached the surface,” Thomas Ronge explained. In fact, deep ocean circulation slowed down to such an extent that the heavy, saline water mass below a depth of 2000 metres was not in contact with the surface for almost 3000 years. “During this time, so much bound carbon in the form of animal and algae remains trickled down from the more intermixed sea surface into the deep water layer that we were able to identify it as the major carbon reservoir that we have looked for so intensively,” says Thomas Ronge. The data also showed that the already old age of the water masses was artificially increased from about 3000 to 8000 years as a result of the injected volcanic carbon. At the end of the last ice age, when the Antarctic sea ice decreased again, the westerly winds returned to the south and the ocean circulation picked up speed again, the deep water enriched with carbon reached the surface of the sea. “The water then released large amounts of the stored carbon in the form of old carbon dioxide into the atmosphere and thus significantly accelerated the warming of the planet,” says Thomas Ronge. There is evidence to suggest that the current climate change causes westerly winds to increase, which increasingly transports carbon dioxide-rich deep water to the surface. “Examining the sensitivity of this system to different time scales and which processes are particularly important is currently a focal point of several research groups at the Alfred Wegener Institute and worldwide,” says Prof Ralf Tiedemann, co-author of the study and head of the department of geosciences at the AWI.